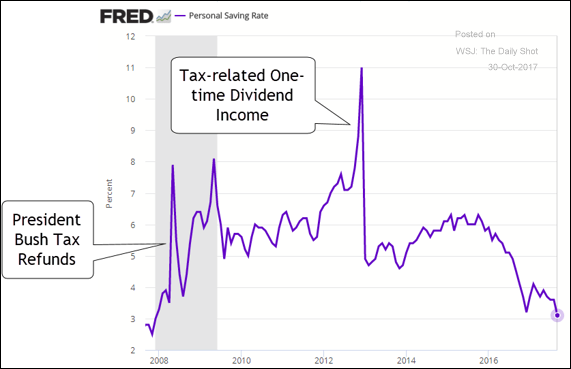 It has been reported that the U.S. savings rate is at its lowest in a decade. An analyst attributed this to the fact that U.S. households’ net worth is at a record high of 670% relative to disposable income. I don’t buy it! Sure, housing and the stock market gains will have provided paper profits for a subset of Americans, but the median American continues to struggle. In fact, leverage levels are escalating for the lowest earners (not surprising), who have not enjoyed much, if any, wage growth in the last couple of decades. 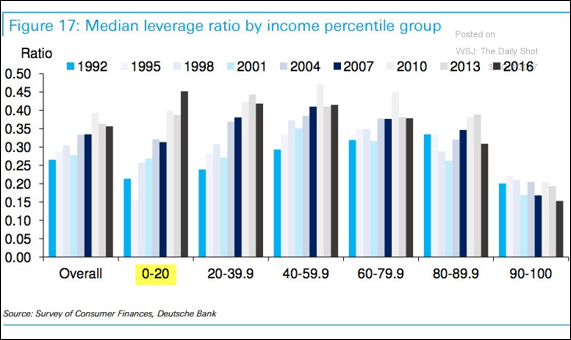 Leverage ratios are at or near the highest levels for the “bottom” 80%. With escalating healthcare, education, and housing costs, why do we think that our lower wage earners have the disposable income to fund a defined contribution plan? Let’s finally understand that DC plans should be supplemental savings vehicles for wealthier Americans, as they were originally designed for, and not the primary retirement vehicle for most Americans, especially lower wage earners. What does the title of this post mean to you? I just got back from Las Vegas (IFEBP), where I had the chance to present twice on this topic. I began my talk by apologizing up front (usually not a great way to start a talk) to anyone attending the session thinking that they were going to glean insights on how much they should allocate to growth versus value, or large versus small, or U.S. versus international or if they should go into alternatives and hedge funds because that just wasn’t going to happen. The above-mentioned scenario is played out in nearly every conversation between asset consultant and plan sponsor and has since our industry moved from having a single bank trust department manage the entire pension plan in some balanced approach. The focus on trying to earn incremental return relative to the ROA by shifting among asset classes and managers is a fools game! I equate this to being nothing more than rearranging the deck chairs on the Titanic. In case you haven’t realized this yet, defined benefit plans are going away in all sectors (public, Taft-Hartley, and certainly, corporate), and the trend isn’t your friend. The fact that we continue to do the same thing year in and year out is mind-boggling! STOP! Managing a pension plan is not an arms race in trying to generate the highest return. It is all about providing the promised benefit at the lowest cost. Unfortunately, the ROA is the pension industry’s iceberg. Are you prepared for the coming disaster? Oh, BTW, I am happy to share with you my presentation that I delivered. Just ask! For plan sponsors with small-cap exposure, the Russell 2000 index has likely been your preferred benchmark. But why? We would suggest, especially if you have your small-cap manager(s) on a performance fee, that you begin to use the S&P 600 as the benchmark. For the 20-years ending September 30, 2017, the S&P 600 has beaten the Russell 2000 index by 1.8%. The advantage is not period specific, as the S&P 600 also bests the R2000 by 1.5% for 10-years, 2.1% for 7-years, 1.8% for 5-years, and 1.9% for 3-years. The advantage is not just related to the annual June rebalance, although that event does explain some of the differentials, as some front-running does occur given that the index is more rules-based than the S&P 600, whose construction is driven by a committee. The S&P 600 is also propelled by screens for liquidity and profitability. Given that the S&P 600 averages less turnover annually than the R2000, the liquidity screen will reduce transaction costs, while the profitability screen (a company must have 4 consecutive quarters of profitability), creates a higher “quality” index. As the equity markets have rocketed forward this year, lower quality names have been favored, but even in this environment the S&P 600 still maintains an advantage over the R2000 by 0.4% for the first nine months. Don’t make it easy for your managers to earn their small-cap fees. Use the S&P 600 and make them work a little harder. Milliman is reporting that multiemployer DB plans have seen a pick-up in their funded status during the first half of 2017, as asset returns have exceeded the annual return on asset (ROA) targets. That is terrific news! However, that is where the good news ends. For those multiemployer plans that are defined as critical and declining funded ratios continue to hover around 60%. At that level of funding, plans need to generate returns that significantly exceed the ROA to begin to make a dent in the deficit. Couple this with the fact that the U.S. is 8 1/2 years into a bull market for equities and 30+ years for bonds, how likely is it that DB plans continue to enjoy outsized returns? Also, please note that the funded ratio is calculated using liabilities that are discounted at the ROA, and not a risk-free rate. This methodology dramatically undervalues a plan’s liabilities, and thus inflates the funded status. Plan sponsors believing that their plan’s funded status is better than it is will naturally act differently than if they had a more realistic view of their current situation. I know that I would. If I thought that my plan was 90% funded instead of something closer to 60-65%, my inclination would be to maintain the status quo instead of searching for a solution to our underfunding. It is a positive development that funding has improved for multiemployer plans in general, but let us not kid ourselves that the average plan has a 90% funded ratio. So, Who Will Help You? Most everyone is aware of the significant seachange occurring within the U.S. retirement industry. We’ve documented for years the demise of the traditional defined benefit pension and the push by sponsors to use defined contribution plans. This trend has been most notable among corporate plan sponsors, but we are now witnessing this migration in public and multi-employer plans, too. We don’t like it, especially since it places an unfair burden on most people in this country who are now being asked to become investment management professionals without the appropriate skills to handle this responsibility. Sure, defined contribution plans give the individual some freedom through portability, but at what cost? We’ve seen the results from this policy change, and they aren’t pretty. In fact, they are fairly ugly. As if that isn’t bad enough, try getting advice from the big wirehouses with an account balance of <$250,000. That’s right, an investor with a “small” account balance will be shuttled to a call center. Unfortunately, size matters in the financial service industry! According to an article by Jeb Horowitz, Advisor Hub, Merrill Lynch will only pay their brokers full commission on accounts greater than $250,000, “while giving one-time incentives for referrals to Bank of America’s no-frills Merrill Edge platform. Well, given the average DC balance, that would basically exclude most everyone that wants to roll a DC balance into an IRA. So much for a helping hand. This post was not intended to pick on just Merrill Lynch, for many of the other wirehouses are doing the same thing. According to Horowitz, Morgan Stanley and UBS are only offering payouts on accounts greater than $100,000. So I repeat, we force those less capable of handling a retirement from a DB plan providing a monthly check into a DC plan where they are now responsbile for funding, managing, and dispersing their acccount. But, when they begin to start the process of dispersing they are most often too small to get the individual expertise that they so desperately need. No retirement crisis? Are you kidding me! In an industry as exacting as the investment industry where trading is measured in milliseconds, a penny miss in earnings can tank a stock, and where performance results are measured to a minimum of hundredths, it is shocking that we still have so much guesswork involved in managing a pension plan. We were recently asked to create a Custom Liability Index (CLI) for a defined benefit plan. Once that task was completed, we volunteered to do an Asset Exhaustion Test (AET) to help the plan sponsor calculate the return needed to ensure that the assets are not exhausted before all promised benefits were paid. Unfortunately, the Return on Asset Assumption (ROA) that is used as a return objective and the discount rate in public and multi-employer plans, is nothing better than a guess. Given that it is nothing more than a guess, it is amazing that plans will have ROA targets as exact as 7.625%. Really? In the case to which I am referring, the plan had “determined” that 7.5% should be the ROA objective. Why? Because! At KCS, we often refer to these ROAs as “Goldilocks” numbers because they are neither too hot nor too cold. But in this case, their target return was too high for we calculated that 6.8% is the return objective needed to keep the fund going. Why does this matter? First, the ROA is instrumental in determining contributions into the fund. A number that is too low will necessitate larger contributions and vice versa. In addition, striving for a number greater than what is needed injects unnecessary risk into the asset allocation process. A plan with a 7.5% return target is likely going to have a lot more equity exposure than one needing only 6.85%. As if this isn’t bad enough, because GASB allows public and multi-employer plans to discount their liabilities at the ROA, a significant majority (like all) are overstating their funded status. But, we’ll save this little ditty for another KCS Blog post. But, They Have To Go Up – Don’t They? For years now, we’ve been hearing that U.S. interest rates MUST rise due to the aggressively easy monetary policy that will lead to inflation. We’ll, glad that we weren’t holding our collective breath! The following chart once again highlights how difficult it is to forecast interest rate changes. Unfortunately, many plan sponsors and their asset consultants were forecasting higher inflation and interest rates. The higher inflation guesses lead them to plow into commodities in 2009 and 2010 only to be significantly disappointed when inflation never reared its ugly head and commodities performed woefully as the S&P GS Commodity index is -10.0% for 10-years and -14.4% for 5-years through 9/30/17. Oh, my! Furthermore, the premature forecast of dramatically higher interest rates lead them to significantly reduce domestic fixed income exposure. This has created the greatest mismatch ever between assets and liabilities within defined benefit plans. At KCS, we’ve been encouraging (imploring) our clients and prospects to get out of the interest rate guessing game despite correctly forecasting that rates would NOT rise (please see a number of previous blog posts questioning the rising rate crowd). We believe that managing a pension plan is a cash flow matching exercise and not a return game. We encourage sponsors to transition their current fixed income allocation into a cash matching strategy that ensures near-term benefit payments will be met. In the process, the plan has enhanced liquidity to meet those payments, removed interest rate sensitivity, while also extending the investing horizon for the balance of the assets that now benefit from more time allowing the liquidity premium to be captured. Why continue to “guess” where rates will go when a strategy exists to get your DB plan onto a glide path toward full funding and more level contribution expense.